The Hermunduri, Hermanduri, Hermunduli, Hermonduri, or Hermonduli were an ancient Germanic tribe, who occupied an area near the Elbe river, around what is now Thuringia, Bohemia, Saxony (in East Germany), and Franconia in northern Bavaria, from the first to the third century. At times, they apparently moved to the Danube frontier with Rome. The Thuringii may have been the descendants of the Hermunduri. Claudius Ptolemy mentions neither tribe in his geography but instead the Teuriochaemae, who may also be connected to both. Strabo treats the Hermunduri as a nomadic Suebian people, living east of the Elbe. Cassius Dio first reports that in the year 1 AD, a Roman named Domitius (possibly Lucius Domitius Ahenobarbus (consul 16 BC)), "while still governing the districts along the Ister [Danube], had intercepted the Hermunduri, a tribe which for some reason or other had left their own land and were wandering about in quest of another, and he had settled them in a part of the Marcomannian territory". Pliny the elder, in his Historia Naturalis, lists the Hermunduri as one of the nations of the Hermiones, all descended from the same line of descent from Mannus. In the same category he places the Chatti, Cherusci, and Suebi. Nearer to us is the state of the Hermunduri (I shall follow the course of the Danube as I did before that of the Rhine), a people loyal to Rome. Consequently they, alone of the Germans, trade not merely on the banks of the river, but far inland, and in the most flourishing colony of the province of Rætia. Everywhere they are allowed to pass without a guard; and while to the other tribes we display only our arms and our camps, to them we have thrown open our houses and country-seats, which they do not covet. It is in their lands that the Elbe takes its rise, a famous river known to us in past days; now we only hear of it. In his Annales, Tacitus recounts how the Hermundurian Vibilius in 18 AD led the overthrow of the Marcomannic king Catualda in favor of the Quadian Vannius. Around 50 AD, allied with Vannius' nephews Vangio and Sido and allied Lugii, Vibilius led the deposition of Vannius as well. In 58 AD the Hermunduri defeated the Chatti in a border dispute over a religiously significant river. The Hermunduri shared a disputed border with the Chatti, along a river with salt reserves near it, possibly the Werra or the Saxon Saale. The Hermunduri won this conflict. When Marcus Aurelius died in 180 AD, he was involved in conflict with an alliance of the Marcomanni, the Hermunduri, the Sarmatians, and the Quadi. Some have suggested that the remnants of the Hermanduri went on to become the Thuringii, arguing that (-duri) could represent corrupted (-thuri) and the Germanic suffix -ing, suggests a meaning of "descendants of (the [Herman]duri)". ^ Strabo (1924) [c.20 CE]. H L Jones (ed.). Geography (Perseus Digital Library). Book 7 Chapter 1. Cambridge, Massachusetts: Harvard University Press & William Heinemann (London). ^ Cassius Dio (1917). 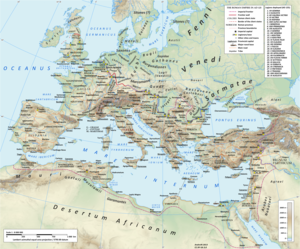 Roman History (Thayer Lacus Curtius). Vol VI Book LV. Loeb Classical Library. ^ Pliny the Elder (1855) [c.77–79 CE]. John Bostock; H T Riley (eds.). The Natural History (Perseus Digital Library). Complete Works of Tacitus. Chapter 28 – Germany. London: Taylor and Francis. ^ Cornelius Tacitus (1942) [c.98 CE]. Alfred John Church; William Jackson Brodribb & Lisa Cerrato (eds.). Germany and its Tribes (Perseus Digital Library). Complete Works of Tacitus. Chapter 41. New York: Random House. ^ Cornelius Tacitus (1942) [c.117 CE]. Alfred John Church; William Jackson Brodribb & Lisa Cerrato (eds.). The Annals (Perseus Digital Library). Complete Works of Tacitus. Book XII Chapter 29. New York: Random House. ^ Cornelius Tacitus (1942) [c.117 CE]. Alfred John Church; William Jackson Brodribb & Lisa Cerrato (eds.). The Annals (Perseus Digital Library). Complete Works of Tacitus. Book XIII Chapter 57. New York: Random House. ^ ? "Julius Capitolinus" (1921) [c.395 CE]. The Life of Marcus Aurelius Part 2 chapter 27 (Thayer Lacus Curtius). Augustan History. Vol I. Loeb Classical Library.